Top Quality heavy-duty vinyl resists chalking and cracking and requires minimal maintenance. 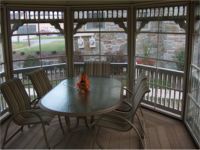 2” x 6” composite decking available in 5 different colors is durable and maintenance free. Stainless steel screws used throughout. 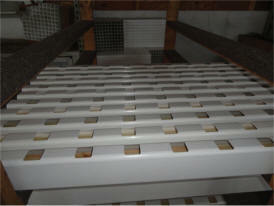 3 ½” x .131” Hot Dipped Galvanized nails used in framing. 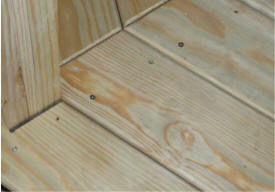 Double 2” x 6” pressure treated floor joists with limited lifetime warranty against termites and fungal infestation. T-shaped vinyl railings “stuffed” with 2” x 3” pressure treated lumber. Posts and Beams stuffed with pressure treated lumber – no shaky or flimsy members anywhere in the structure. 2” x 2” vertical square spindles in railing and top rail. 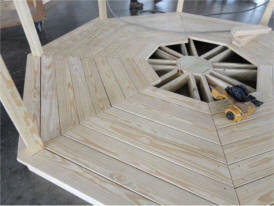 Each spindle is set securely inside 2” thick lumber. Vinyl covered ceiling for low maintenance. Electrical Package only $150 and includes outlet, switch, and fan/light wiring. 8” or 10” top plate depending on size. 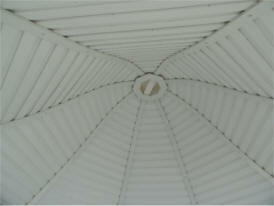 Double 2” x 4” rafters or 2” x 6” depending on size for additional durability. 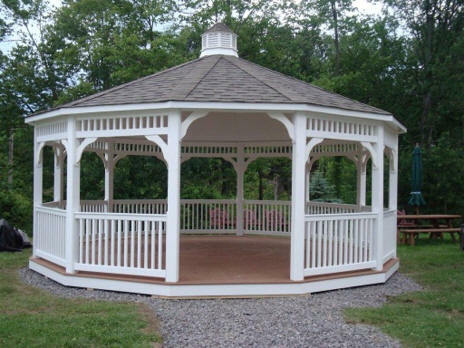 Popular options are reasonably priced like screens, Victorian braces, benches, double roof, bell roof.